I will not comment on the music, since it would be pointless, for obvious reasons. I am really dumbfounded at how this SACD gets so much praise. When I first put this SACD in my stereo, I had to grab my head in pain (and no, its not a metaphore). I never thought of myself as an audiophile, or a person with extra hearing abilities, but the first thing that struck me when I heard this one was a high pitch tone (around 15-16Khz frequency range) which made my listening experience quite a disaster. I just had to plug my computer and grab this one via the analog outputs, to analyze it- the results are in the attached links. As you can see, you dont need to have any superhuman abilities to hear this tone- its VERY LOUD. This appears on all the versions of this title, apart for the regular CD - this "dog sound" was filtered out (funnily enough, some audiophile CD versions of it were not filtered). 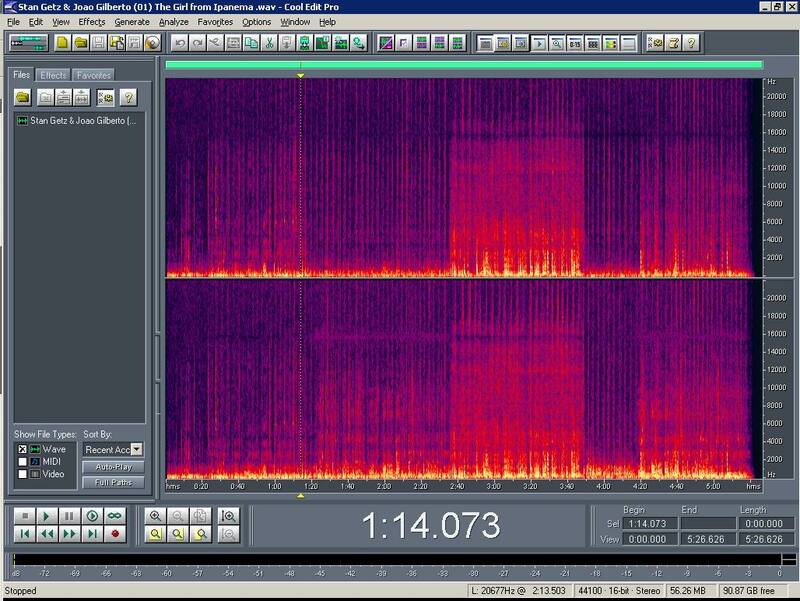 If youre ear stops at 14.5Khz, or you have some sort of notch filter in your head- get this version, it is great. AVOID AT ALL COSTS (if your hearing is important to you) and buy the less dynamic/non harmful CD version. This is definitely a "classic" Latin jazz album that many people will be familiar with. Latin rhythms such as samba and bossa nova were wildly popular in the 60s and were hailed as the "New" sound. Recently there has been a resurgence of interest in Latin jazz after years of neglect, and certainly many people would know of the signature tune "The Girl From Ipanema" even if they do not like it. Getz/Gilberto is the second album featuring saxophonist Stan Getz exploring the genre. The first, "Jazz Samba", featured Stan with guitarist Charlie Byrd went to No. 1 on the US Billboard album chart, but it was essentially a group of white jazz musicians emulating the Latin sound. This time around, Stan decided to collaborate with the real McCoys: guitarist/vocalist João Gilberto and pianist/composer Antonio Carlos Jobim. It also featured the debut of sultry singer Astrud Gilberto - João's wife - on "The Girl From Ipanema" and "Corcovado." The circumstances of how a demure housewife got a chance to sing in the recording sessions are varied but as they say, the rest is history. I own several versions of this album: an old, extremely scratched and battered LP, as part of a collection entitled "Stan Getz: The Girl From Ipanema: The Bossa Nova Years", the Verve Master Edition remastered CD, and now the Super Audio CD. The SACD easily bests them all - including the LP which was bought second hand. If the LP had been in a better condition, things might have been different. In any case, this is simply a must buy if you own an SACD player. What struck me about the SACD version (in comparison to the Verve Master Edition CD and an earlier reissue) was the additional "presence" and definition of the voices and also the saxophone. The saxophone "leaps" onto the soundstage and almost seem "larger than life." Similarly, Astrud Gilberto's voice has a relaxed, lilting quality that seemed more "solid" on SACD, with no trace of "harshness.". Lastly, the cymbals seemed to have an additional timbral detail, "tinkle" and clarity to them that seemed more "natural" than the "forced" sound on the CDs. In other respects, though, it was hard for the SACD to improve upon the already excellent Master Edition CD (downsampled from the 20-bit transfer). In particular, I did not really notice any improvement in imaging and the slight mid-range stridency I found on the CD is also present on the SACD. Hiss is omnipresent on both versions, and probably indicative of the age of the recording. I noticed several instances where the SACD was revealing more of the recording's faults than the CD. In a few places, I thought I heard very minor tape dropouts and high frequency phase shifts (normally associated with tape head misalignment) that were less noticeable on the CD. I attribute these to the superior resolution and micro-dynamics of the SACD rather than a fault in the transfer. The SACD has the same tracks (including two bonus tracks from 45 rpm issues) as the Verve Master Edition. The bonus tracks have a very narrow soundstage and I suspect they are monaural recordings. The booklet is also identical to that on the remastered CD and feature a retrospective essay by Doug Ramsey (November 1996) as well as the original liner notes and facsimiles of the original album cover and artwork. Like all other Verve-issued SACDs, it is packaged in a super jewel box. There is only one layer, which is a pity because if it was a Hybrid it would give me an opportunity to get rid of my Master Edition CD. As Flytomars mentions, there is a spike of signal(noise?) 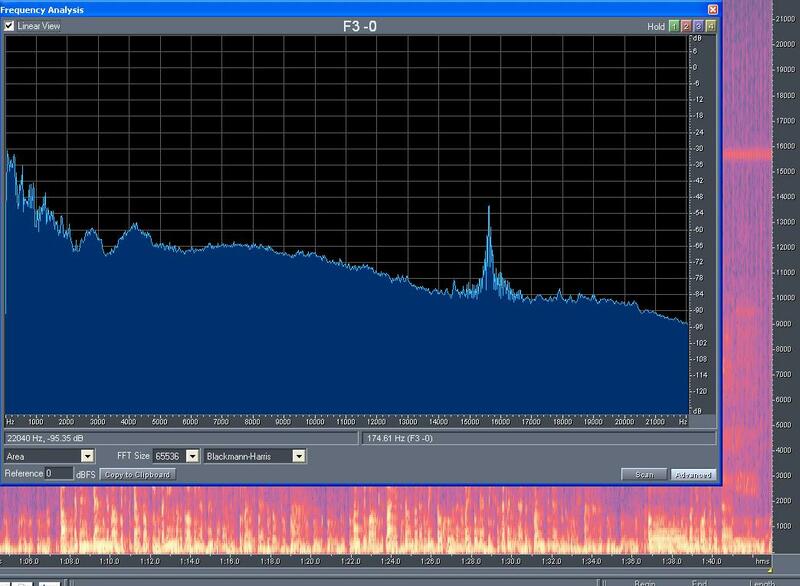 at about 15,500 Hz, but what he does not say is that the spike never goes above -48db. 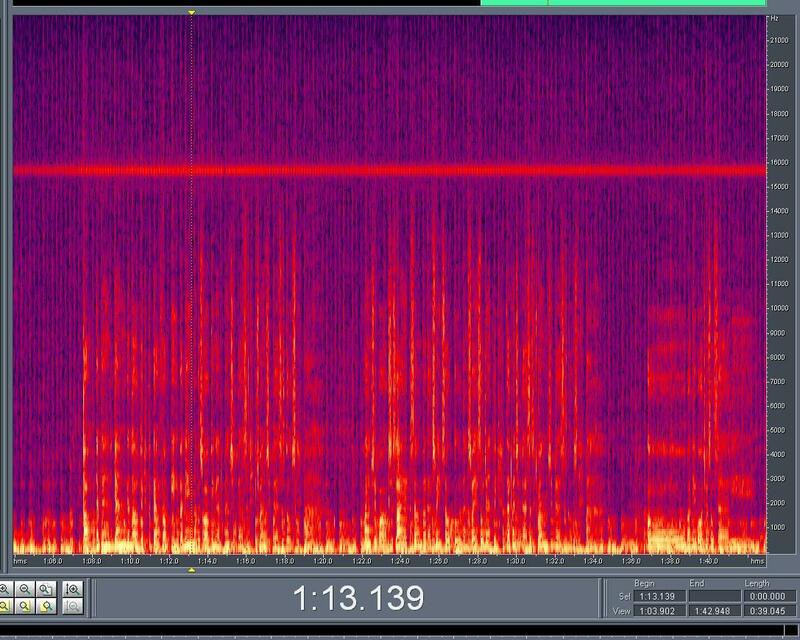 As per my personal analysis - after doing my own recording of the material and checking out the spectral display -, the 'noise' seems to be especially present in the first song, while less so, for example, on the 5th one. There are also some signs of another signal or noise at about 31.5 kHz in some parts of the first and 6th songs. These could be harmonics of the other one. In any case, I believe this 'noise' must be present in the original tapes. (BTW, as an interesting note it seems that some musical information on a few of the songs goes up to about 30kHz). 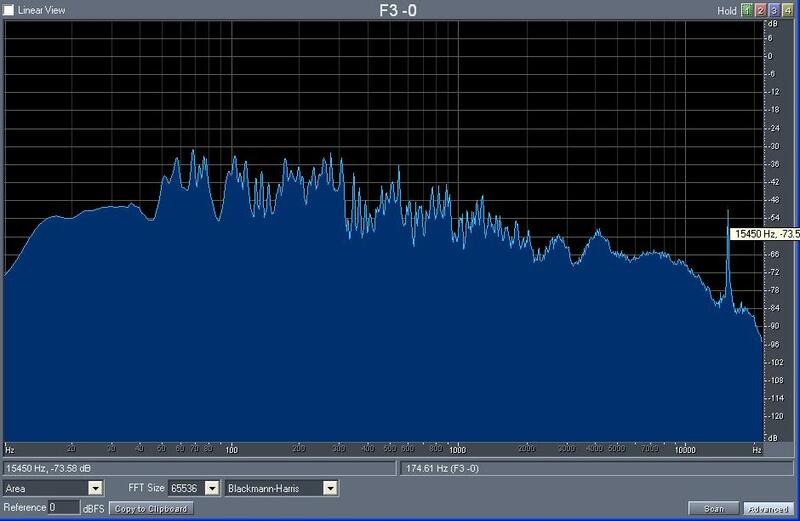 On another note the frequency spectrum graph Flytomars posts of the CD seems to show that this noise was doctored out in that version, as is obvious by the blank space seen at that frequency on most of the songs. I can make no other observation about this as I have not heard the JSACD, nor the CD and thus cannot venture comparisons. Albeit the noise mentioned by Flytomars (which I personally have been able to see on the graphs, but not hear) and other tape wear flaws noticeable on this disc, this SACD sounds very nice to me.